our perfectly imperfect life: Bear with me! Hi, I'm a lurker from over in Orange county :) I love the picture in your header! your blog is looking great.. I think you know what my blog is about ...when i blog! I love your blog and love what you guys are doing..adopting. Bless you and your family. I blog about Rustin my almost 3 yr old w/DS and life. I'm new to the blogging community but my blog is about life and an angel with T21! Hi It's me Sarah blogging about my life as a teenager with Down syndrome. I blog about...everything....but mostly my family....and Kob's. I have two blogs, one family and one about our adoption. What a beautiful blog, especially the beautiful photography of your sweet children. Come and check out our blog sometime... www.monicacrumley.blogspot.com My little John Michael has beautiful eyes, too, like deep blue marbles with wispy clouds. love the pictures in previous blogs, the eyes were great, what beautiful eyes and such different colors.And the picture of Nika was too sweet. It's our family record, baby book(s), way to update friends and family on our lives that just happen to include Ds, and anything I happen to be thinking about. It's been wonderful to 'meet' so many new people in the world of blogging. :o) Your blog is so cute! I would love to be added to your blogroll. My blog is about my trips to the Philippines. My blog is about family and adopting from Russia. I love, love, love your blog! Your kids are all precious and adorable! Love your blog! Mine is "The Littlest Tsarina" (kimabraham.blogspot.com) It is about life with our four bio boys and a sweet girl adopted from Russia. I have a blog because of having Jack (ds) but it's really about our whole family. Yours is always lovely, btw. I’ve been out all day and look what I have missed…. Masons birthday post ! WOW!! you have quite a following! I'm a lurker from OH and I have a blog about my 6yr/old daughter w/DS--throwing christian/prolife things in where I can. I love reading your blog. Mine is about life and Down syndrome! Em's blog is all about Em, extra chromosome and all! She was adopted, but it's more about DS. Look at you all high tech!!! Looks like you already have me listed. I read, but don't always comment. Sorry. I blog about life, down syndrome and knitting. Here I am, blogging about my princess, Samantha: www.thebatesmotel3.blogspot.com. 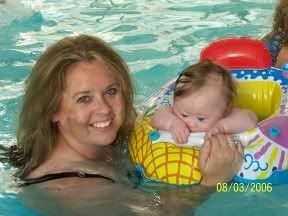 I blog about my baby with down syndrome. Love your blog! I check in on you guys quite frequently. You have a wonderful family. We are a family touched by Down syndrome biologically, and a family in the process of adopting a daughter who is also touched by Down syndrome. I comment alot...I am a lurker that comments. I do have a blog at www.lovefor9.blogspot.com. It has recently been set to private due to harrassment, however if you want to add me to your blogroll and you or others want to visit me, just send me an email at luvfor9@gmail.com and leave me a message as to who you are and why you want to visit my blog, along with an email address for me to invite you to my blog and we will be in business. I have about 50 followers now and talk mainly about my life as a single mother of 4. Fellow blogger with that extra chromosome! Mostly about PJ, extra chromosome and all, and us, the family who loves him!